HENSEL make junction box, panel, plug socket, KV and MI boxes, hard rubber cable drum, cables gland, busbars boxes, Distribution Box In engineering thermoplastic(PVC). We are offering a wide array of AC Drive Panel that is used for controlling alternate current distribution. The offered panel is precisely manufactured under the expert supervision of skilled our professionals using the best quality raw material and innovative technology. 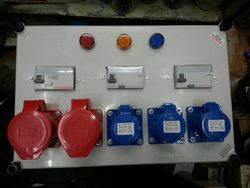 This control panel is also checked on various quality parameters and is available in various specifications at affordable price.